Clicking on the small pictures to the left will enlarge them. 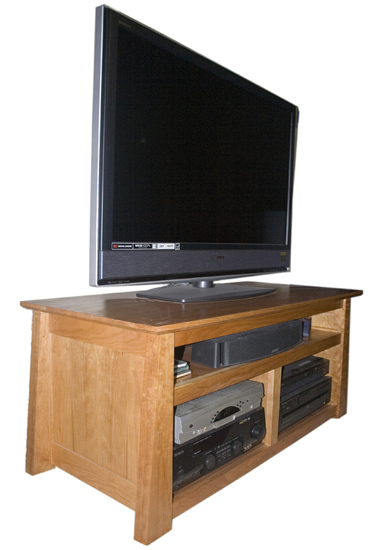 Dimensions: 50.25" long, 21.75" tall by 22.25" deep. 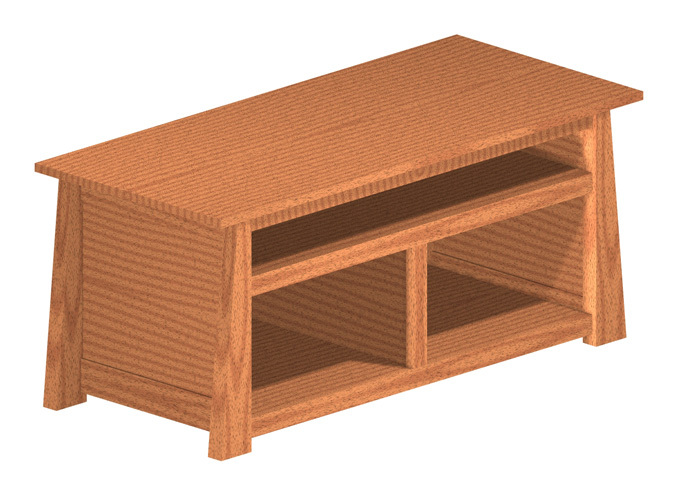 CAD drawing of the stand with no shelves (the lower two compartments will contain shelves). 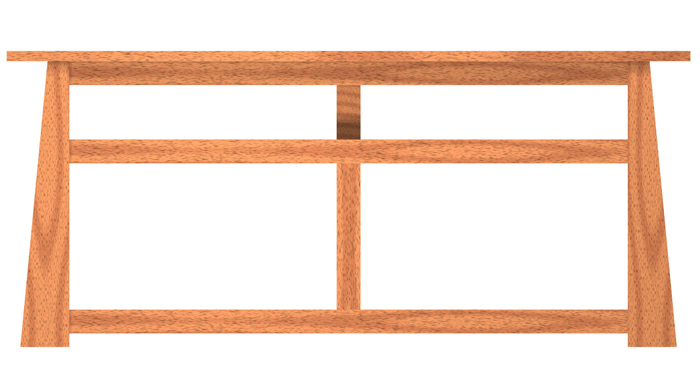 Side panel grain will actually run vertical NOT horizontal as pictured. 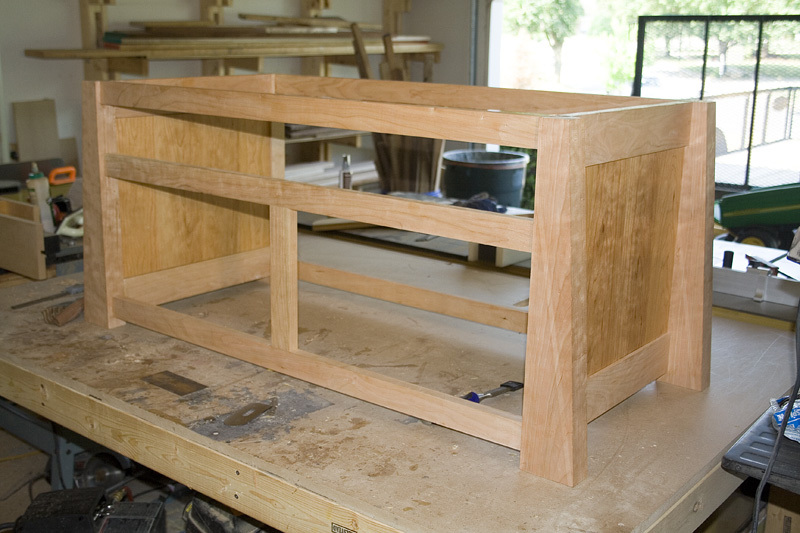 Sides will be made from solid cherry flat panels. 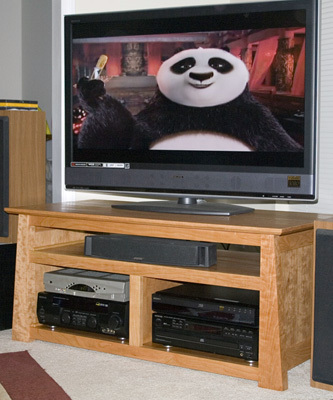 I usually use plywood panels for an application like this, but I thought I would take things up a notch! CAD drawing of the front view. (back removed for clarity). 5/31/08 Purchased all required lumber for the project, minus the back which will be 1/4" cherry plywood. 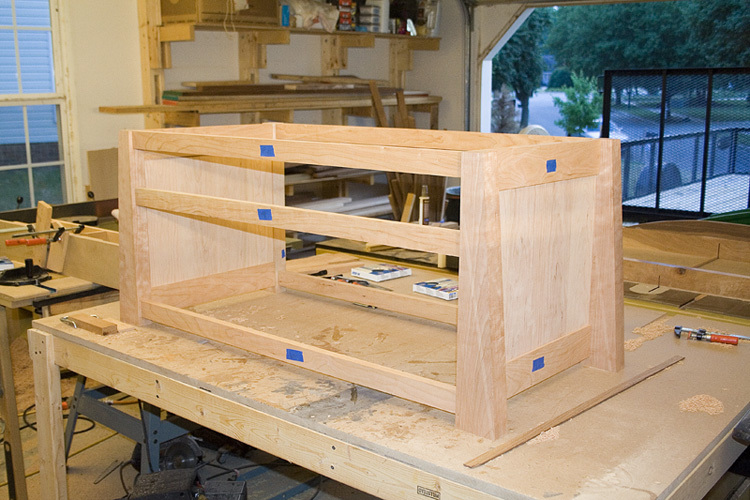 6/07/08 Milled the lumber for the legs and rails. 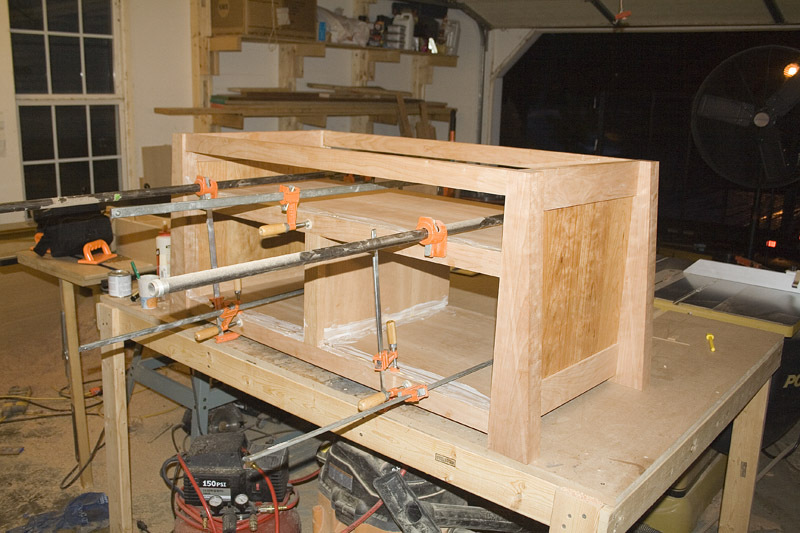 Tomorrow I will mortise the legs and the rails for the floating tenons. If all goes well I will do a dry fit for panel measurements. 6/10/08 Dry fit of main carcass assembly. The side panels are made from 4-pieces of cherry that are book matched (first time doing this). The blue pieces of tape remind me which side is to be on the outside. 6/11/08 Completed first subassembly. Glued-up the sides today. To make finishing easier, I pre-finished the panels. 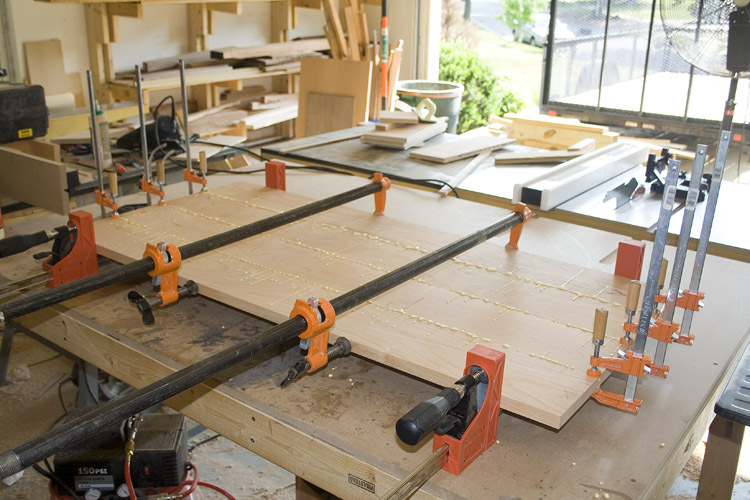 6/14/08 Cut out the shelves (3/4" cherry ply) and ledgers. I also glued the shelves to the ledgers and installed the center divider which sits in a dado in the top and bottom shelves.. The white paste is Waxilit, which makes glue clean up significantly easier. 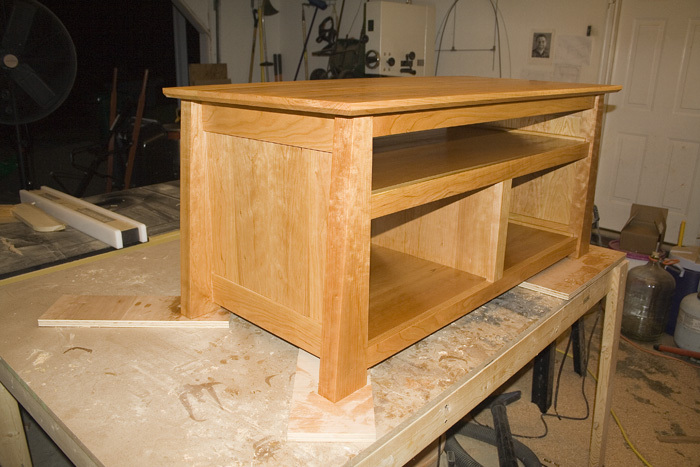 6/15/08 Glue-up of the top. Four cherry boards 5-3/4" wide. 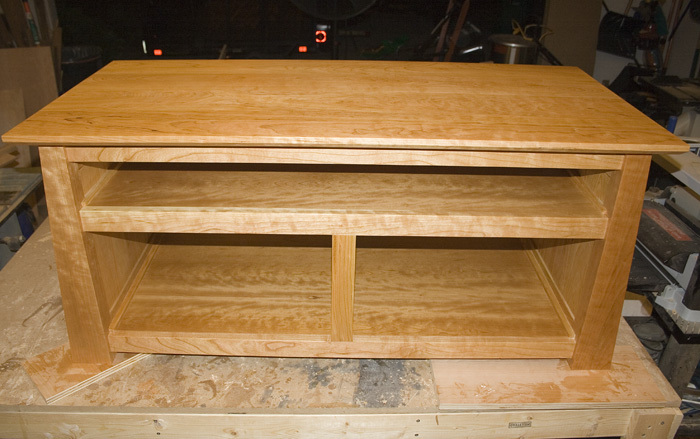 6/17/08 Finished with three coats of a blend of 2 parts Minwax "Tung Oil Finish" and 1 part pure tung oil. 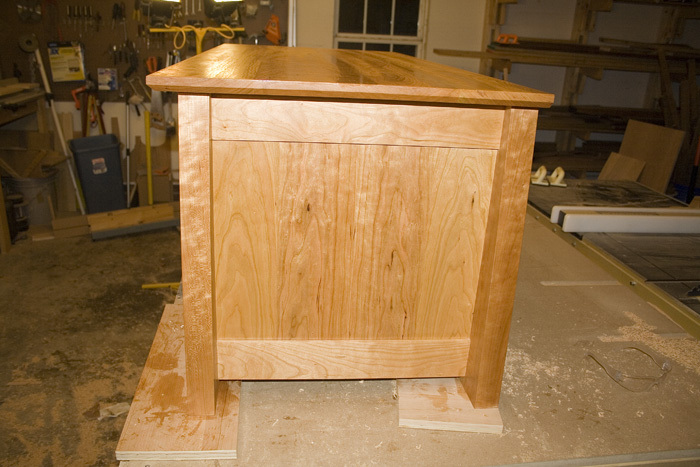 A rabbet is ready in the back to receive the 1/4" cherry ply (not on yet). The panels are made from four book matched flat cherry panels. This was my first time book matching.